This story is written from the perspective of the support crew at this year’s RtN in Parry Sound, Ontario. We spent many years supporting our son, TOT team captain, John, during his BMX racing career and into mountain biking. So when the call came asking if we would be the support crew for this year’s RtN of course we agreed. We knew John’s teammate Randy but had not met Annie or Steve. John and Randy have been racing together for some time. They have raced with Annie and Annie has raced with Steve, but this will be the first time the four have raced as a team. We have high hopes for this combination. While the team was getting their bodies and spirits in shape for this undertaking we were planning how to get their equipment from place to place. We made trips to several stores looking for the perfect cartop carrier. Last year we had a van and this year we have a pickup with a crewcab so we were looking for some extra carrying space over the bed of the truck. We found what we thought would work for us. Individual team member tubs should fit inside the bed, our equipment should fit in the carrier on top of the bed cover, 4 bikes on the hitch mounted bike rack and our personal stuff in the backseat of the cab. Keith picked up a canopy with 4 sides this year. RtN was cold and windy last year. We were determined to be prepared in case this year was a repeat. We found a good spot to put the canopy on the back of the truck and bungee corded our chairs to the roof of the cab. We packed our mandatory gear including our tent and then packed everything we thought we would need to make the team comfortable during transitions. Most of the items in the cartop carrier were for use in the transition area. A campstove, food, lighting in case the transitions were in the dark, plates, cups, spoons, saucepan, thermoses for keeping soup hot and a small heater for inside the canopy. The plan was coming together. TOT will arrive at our house on Thursday in two vehicles. They will drop off one vehicle, transfer equipment to our truck and we will go on to Parry Sound. They will be up early on Friday to check in. During the afternoon we will go over equipment with each racer so we know what they expect during the transitions. We then have a pre-race meeting at 4:00. After the meeting Keith and I will pack the truck and let the team get some rest before the start at midnight. Sounded smooth until the team arrived at the house. Oh, oh, some of the tubs were too tall to fit under the pickup bed cover. A little rearranging is necessary. We have some shorter tubs in our garage so we empty the tall tubs and repack into the shorter ones. Problem solved. We had an uneventful drive up to Parry Sound. Because of the threat of West Nile, SARS and Mad Cow Disease we held our breath going through Toronto. The scenery was beautiful and wilder the further we went north. Signs said the Georgian Bay has 30,000 islands and I believe it. Some islands were so small a house took up the entire island. 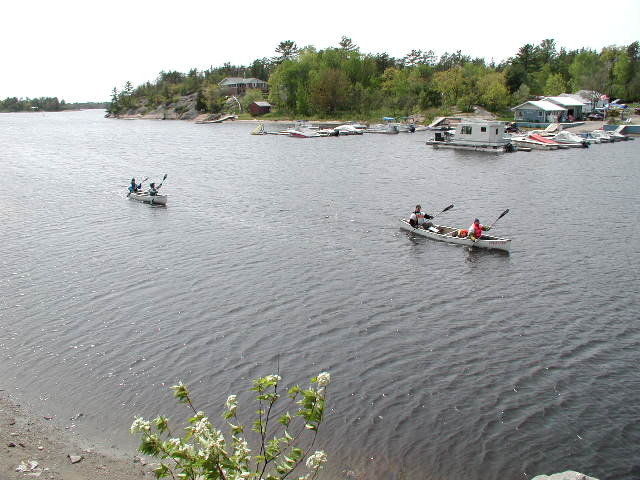 Parry Sound itself was a small town and seemed dedicated to recreation and adventure. Unfortunately, when Steve picked up a local paper the headline read, SARS IN PARRY SOUND. Oh well, we’ll be out in the wilderness; SARS won’t have a chance out there. Friday morning registration went smooth thanks to the efficiency of the RtN staff. The team was excited to be here and the weather looked beautiful so far. We returned to the motel for equipment checks and last minute changes in transition plans. Before the race there had been a lively debate about whether to switch packs at transition and whether to change to bike shoes or just use one pair of shoes. In the end they all decided to go with one pack but the shoe debate continued. Each team member arranged their equipment and labeled what they wanted for each discipline. They also put together packages of food and goodies they wanted to take at the transition areas. The parking lot was full of equipment for our team and others at the motel. The TOT and Dagger banners were on prominent display. Luckily, we had an unofficial but essential member of the support crew. Some of the team HAD to be back in Illinois Monday AM, so Annie brought her friend Vicki along as an extra driver for the trip home. Vicki was a lifesaver more than once. While we went over equipment she ran out to the local bike shop and picked up some items for the team and helped set up bladders for the transition area. We also needed some more food. The 4:00 meeting finally came and the team got their maps and instructions. Now the excitement would start. The team went back to the hotel and plotted their way across the wilderness and then got some rest while we squeezed the equipment back into the truck and picked up pizza for everyone. We were allowed a second support vehicle to get to the start line so Vicki agreed to drive the team. We gave her a copy of the driving instructions for the support team so she could meet us at the transition area on Saturday morning and see the team on their way through. We left for the start line around 11PM with spirits running high. They will start on bikes but there was a slight problem with Annie’s bike after we unloaded it. After some adjusting the team continued to move to the start line. At midnight they were off. We were told that we would be allowed to go the bike pickup in about two hours after all the riders went through. We were also told that they would not be as strict this year and we would be allowed to go into town, stop off and have a shower etc. if we wanted. We just had to let race staff know where we were. This was a real plus. Vicki kept the motel room in town so we took advantage of the rules and went back to the room to get some paperwork we forgot. We went back to the start area and waited for the release to pick up the bikes. We were told that we would be released about 2 or 2:30 AM. But time marched on and about 4:00 people started getting antsy. We were finally let go at 4:30. No sleep because we expected to be released any minute. We picked our way through the back roads in the dark and found the bike drop off. Since it was still dark we had difficulty finding our team bikes. But finally, success, they were up near the front. This is a good sign! We were told at the support meeting that the first teams would not be expected before 8:00 so we didn’t hurry to the first transition area. May as well set up in the daylight. 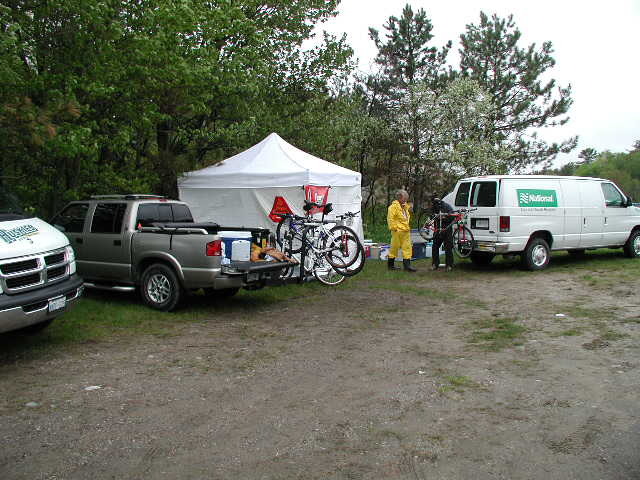 The first transition area was in a provincial park. Support crews set up near the canoe takeout area. The park also had a big plus. Flush toilets were only a 60 second walk away in the campground right behind us. Also there was a hose for cleaning off bikes in the maintenance yard. We got our canopy set up and unpacked what we needed from the truck. It was pretty chilly and windy so we used all 4 sides of the canopy. The Velcro ties kept letting go so we had to improvise by using clamps to hold the corners together. We fired up the heater and tried to dry out bike shoes and chairs. We were too excited to sleep or eat. We knew we would see the team soon. The teams would be coming in off a long paddling section. TOT had rented some fancy schmancy carbon fiber paddles that came in 5 pieces and were incredibly light in their packs. Hopefully the price of the rental would be worth it. At 7:57 we saw the lead team come into the transition area. Now the support teams were getting excited but the weather had turned. It was very windy with a misty rain. The lead team was tired and was still in the transition area 45 minutes later when the next team arrived. Race staff was very helpful and communication was excellent but that didn’t erase the fact that 39 teams were still out there in terrible conditions with 3-foot swells, whitecaps and a fierce headwind. 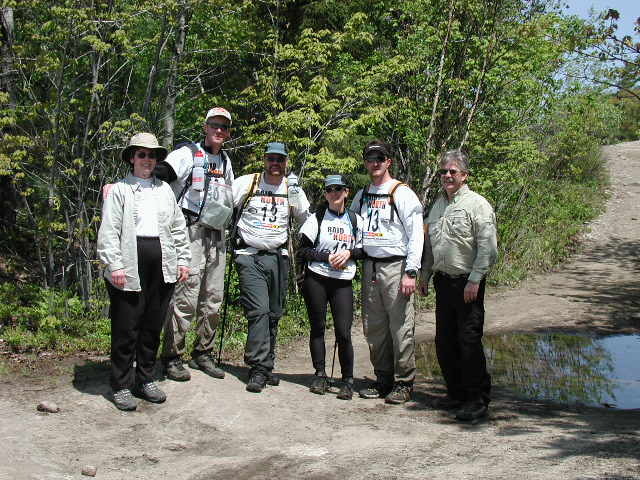 Our team was one of the few that had left checkpoint 4 and was headed to checkpoint 5, TA 1 was also checkpoint 6. We heard of several teams capsizing and the rescue boats were busy. 8 teams were stuck on an island waiting for rescue but our team was still forging on. The support crew next to us heard from their team. They were taken in by a family and were enjoying some warm beverages at their home. As teams were rescued, the race staff came through the camp looking for their support crew to pick them up and transport them to the transition area. Meanwhile Keith cleaned up the bikes and made adjustments because they will be back on a bike section when they leave the transition area. Vicki arrived to wait with us. It was a real nail biter for the support crews. We heard stories about the rescue boats reluctance to go out because of the poor conditions on the water but our team was still out there. Finally we heard that they had cleared checkpoint 5 so we started to get ready for them. They would be cold and wet so we heated up the soup and readied the gear. 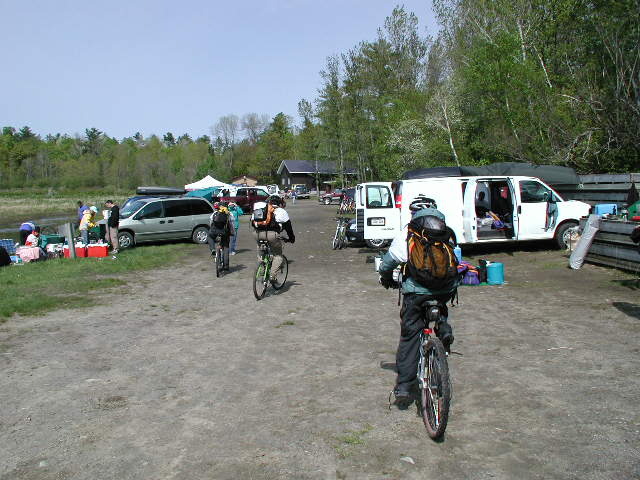 The transition camp was a buzz of activity by then. There was a hill where support crews watched the final stretch of paddling. The weather turned sunny but it was still very windy. We were ready and anxious. The camaraderie of the support crews was great. Each time someone could see canoes coming there was a lot of hollering between support crews about who was coming. Before long we were the lucky crew. We had binoculars but their team number wasn’t visible. Annie had gotten cold and wore her space blanket under her life jacket. Others had put on more clothes. But we finally recognized their smiles when they saw the canoe takeout. They were tired and had sore arms from paddling but we got some soup in them and restocked their packs. The crew next to us shared some of their hot food as well. We were extremely proud of our team. They made it through the roughest paddling section where most other teams gave up or were plucked from the bay. This became a source of pride around the campfire at the second transition area. We were able to say that our team was between checkpoint 7 and 8 AND had finished the paddling section. That gave us a certain status among support crews. We left TA 1 and picked up the bikes at CP 7. An easy drive where we discovered that the road to TA 2 took us back almost all the way to Parry Sound. We decided to take advantage of the relaxed rules again and stopped to visit Vicki and have a shower and a muffin at Tim Horton’s. The second transition area, checkpoint 9, was located down the worst road we had ever driven. Keith was glad we had four wheel drive because there were several spots where we encountered large mudholes loaded with rocks. We were also glad that we were able to negotiate it during daylight. One area was actually lower than the lake surrounding us. This TA did not have the amenities that the first TA had but it was situated on an idyllic lakeshore and at night the stars shown brightly against the inky black sky. By the time we were set up it was midnight and we were told that the fastest they would make it from checkpoint 8 was 2 hours. The earliest we expected to see them was 2 AM. So we set our alarm for 2 hours to get some sleep. Keith was confident and didn’t want to set up the tent so we slept in the cab of the truck. We checked in with the race staff at 2-hour intervals until daylight. The team would probably not meet the cutoff to go on so we were concerned about how we would get them and their equipment out of the TA. Keith asked if we would be expected to pick them up at checkpoint 8 and he learned that would be impossible. Checkpoint 8 was so remote that vehicles could not get in and the CP 8 staff had to hike in. We found out later that our team had hunkered down for a few hours during the darkest of the night so they wouldn’t stumble over a 49 ft. cliff. We finally got word from the TA staff that our team had passed checkpoint 8. They asked race staff to relay a message to us that they were fine and moving on. Hooray! They’re coming but still how will we get them out? We combined as much as we could to conserve space. Some of the tubs had some airspace in them; surely we can get more stuff in there so we can empty the back seat. We started to plan how we were going to stack things on the truck. We were at the point of planning what to put in the back seat that was flat so the men could sit 3 across with Annie lying on top when Vicki came to the rescue again. She arrived about an hour before the team came into the TA. Not only was she a lifesaver, she also brought Egg McMuffins! We started walking down the trail to greet our team coming in and saw another team. We asked if they saw team #13 and they said they saw a team they thought was American. It had to be them! Five minutes later we saw them. They made it a full 36 hours, never gave up. They may not cross the finish line but hopefully they are as proud of their accomplishment as their support crew. When asked later about whether he intended to do it again next year, John did not hesitate. Of course he’ll be back; he has to finish it.